Berklee College of Music grad Vanessa Collier has been on a rapid ascent towards blues stardom while still short of her 30th birthday. Just one time listening to her latest CD, Honey Up, which she funded in part through a crowdfunding effort, and you'll be hitching a ride on this young woman's bandwagon. Yeah, it's that good. Ms. Collier is a true triple threat --- an accomplished sax player, a very fine soulful singer with some roots in gospel, and a prolific songwriter. If that's not enough, she also plays a little guitar on Honey Up. The church influence shows up on the opening cut, with the very New Orleans-ish "Sweatin' Like A Pig, Singin' Like An Angel," on which she describes the atmosphere in rural Southern churches. William Gorman chips in with the requisite Crescent City piano, while Collier's sax work is mixed in behind her soulful vocals and Laura Chavez rips off a hot guitar solo midway through. The tempo picks up considerably on the rollicking gospel-influenced "Don't Nobody Got Time To Waste," with Collier's sax work supplemented by trombonist Quinn Carson and trumpet player Doug Woolverton. Not only does Collier sing lead and play the sax on this one, but she also dubs in background vocals. Versatility, thy name is Vanessa. Collier gets funky on the sax on the title cut while she tells her man that she is going to refuse to meet his demands to "honey up." Chavez gives her guitar the appropriate Memphis funk effects to make the listener think that this one might have come out of the Stax songbook, but instead it's just one of the nine Collier originals on Honey Up. More funk follows on the Memphis-style instrumental "Percolatin'," pretty much a showcase for Collier's exquisite sax playing although the other instrumentalists all get the chance to stretch out throughout the number. "Icarus," a song on which a young man is urged to follow his dreams, is a vehicle for some of Collier's best vocal work on Honey Up as she urges young Icarus to reach for the sky and fly before he learned from his mistakes and kept going. "Fault Line" comes in with a slower tempo but with a a full wall of sound across the board, accentuated by a strong guitar solo by Chavez. Collier starts off "Bless Your Heart" with some tasteful resonator guitar picking as she attempts to put an interfering man in his place. " ... Don't call me sweetheart, don't call me baby, don't call me anything but my name, you must be foolish because I ain't your woman, your daughter or your friend ..." I realize this is getting repetitive, but once again Chavez jumps in with some killer guitar. The mid-tempo shuffle "You're A Pill" shows a different side of Collier's relationships, as this man makes her weak in the knees. Another showcase for Collier's stellar vocal work as she starts out with an a capella intro before the band joins in. Again, the background chorus comes from the voices of Vanessa, Vanessa, Vanessa and Vanessa being dubbed in behind Vanessa's lead vocal. "You Get What You Get" is another tune with a distinct New Orleans feel to it, highlighted by Gorman's piano playing. Bringing this wonderful album to a close is the only cover, a slow version of Chris Smither's "Love Me Like A Man," giving Collier another chance to show off her soulful yet sassy voice, this time using some breathy vocals for the right effect. Sparky Parker comes in with strong guitar work and of course we get a killer tenor sax solo from Collier. Yes, folks, she's good ... very good. 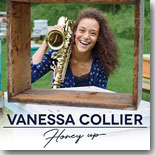 Listening to Honey Up while writing this review had me searching through Collier's calendar of upcoming performances. I need to see this fantastic artist soon. I'll be watching for her to get anywhere near my part of the country, but until then I have Honey Up to fill that void. Top ten album for 2018? You can bet on it!